As the saying goes, everything old is new again. The following phrase completely describes the return of plantation shutters as window decors for the 21st century. Nowadays, more and more people tend to choose window plantation shutters for their flats, studios, verandas, outdoor patios, porches, and balconies. Beyond making your home look elegant and stylish, plantation shutters come with many valuable benefits. If you are searching for first-class interior plantation shutters, look no further. BuyHomeBids is your one-stop shop for all shutters needs. 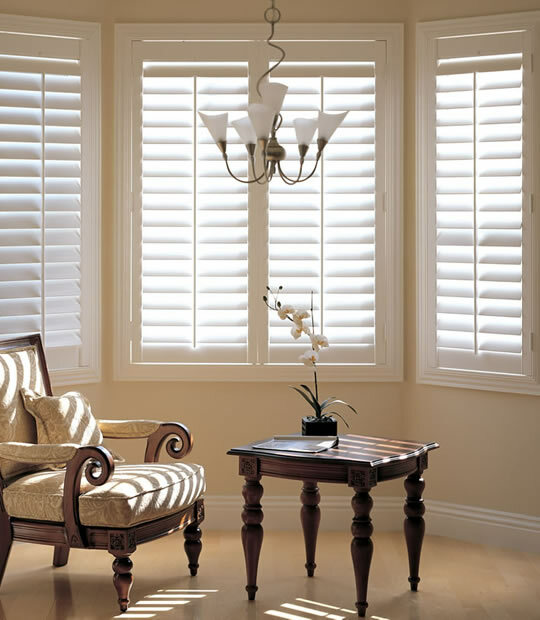 Here, you will find a broad assortment of plantation shutters that come in various colors, sizes, and styles. No matter whether you are looking for faux wood shutters, real wood painted shutters or real wood stained shutters, we’ve got you covered. Browse our online catalog and choose plantation shutters that suit your home decor and budget best. Their versatility makes them desirable for both traditional and contemporary decors. Available in the traditional louver size of 1-7/8", or the plantation shutter sizes of 2-1/2", 3-1/2", or 4-1/2". Arches, full-height or café, multiple or single-panel configurations, inside or outside mount, painted or stained. Come with pre-drilled holes, they're very easy to install. Our shutter experts are on staff to answer your questions before and after you buy. Please, browse our selection, below and feel free to call with any questions or concerns. 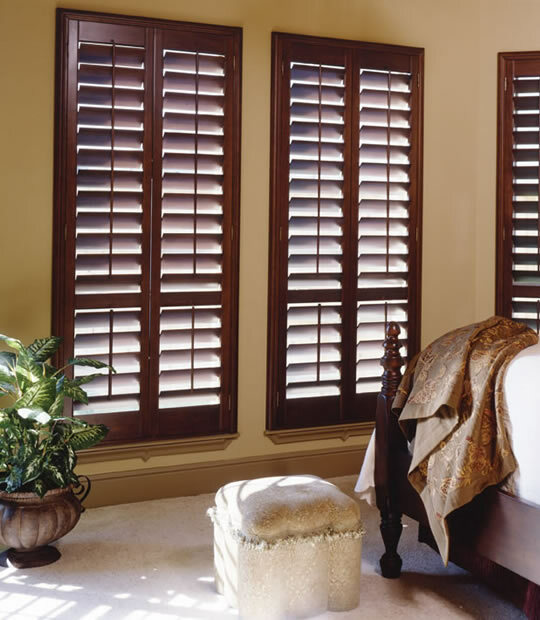 We will love to talk with you about adding our beautiful shutters to your home! If you need help, please feel free to call our shutter expert. Plantation shutters have a long history. It’s worth mentioning that they originate in the American South, from the farms that typically grew cotton, coffee, tobacco, and sugar. Such farms were commonly known as plantations. Because the climate in the southern states of America is subtropical, the summers are extremely hot. The traditional window furnishing people used in their houses was thick and heavy — it wasn’t supposed to keep the house cool. As a result, American people decided to invent lightweight wooden curtains also known as plantation shutters. Large slat size is the main feature that separates wooden shutters from regular ones. When plantation shutters are fully opened, they let in a significant amount of light and allow for maximum airflow, helping to keep the apartment cool. In most cases, plantation shutters are painted white, as white reflects heat. And when plantation shutters are closed, they block out light and give maximum privacy. Longevity: unlike fabric drapes, wooden shutters won’t fade due to sun’s harmful UV rays or aging. Easy cleaning: all you need is a damp cloth to wipe over the blades. Comfort: custom plantation shutters are constructed and measured to fit snugly into any window frame. Wide choice of materials: you can choose between natural and artificial materials. Upgrade and enlarge the appearance of your rooms. 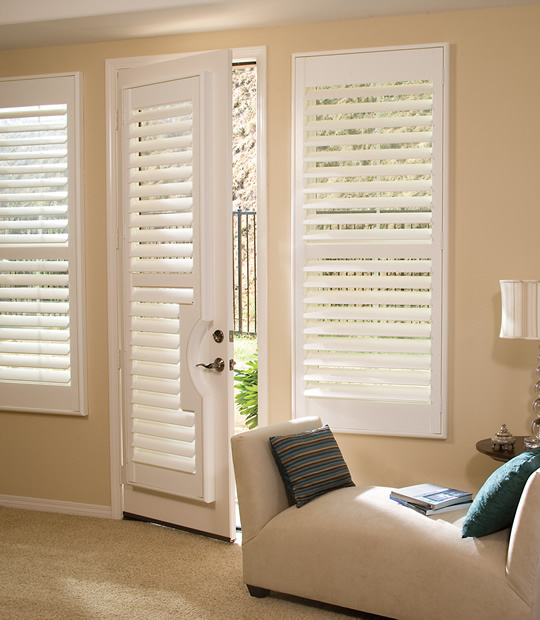 Sliding plantation shutters work remarkably in plenty of modern interior design styles. In addition to upgrading the appearance and adding value to your property, wooden shutters also eliminate the need to update window furnishings on a seasonal basis. Our online store provides plantation shutters for every taste and budget. Faux wood and real wood painted shutters we supply come in a variety of white-toned neutrals with an assortment of hinge finishes to match your style of decor. Check out our plantation shutters prices and choose the option that best fits your budget and decor goals. BuyHomeBlinds plantation shutters — designed to enhance the beauty of your house.